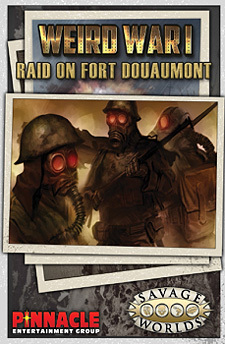 Raid on Fort Douaumont is an exciting mix of action, warfare, and horror by Eddy Webb and the mysterious Teller. Your heroes are French infantrymen who meet Sir Arthur Conan Doyle, battle ancient evils, and lead their section into the blasted remains of Fort Douaumont itself! It's a creepy tale of wartime horror that should challenge even the most gallant soldier. Requires Savage Worlds core rules and the Weird War I setting books to play.